A well designed kitchen is an everyday celebration and joyful meal on an occasion. Kitchen is considered to be the heart of home and a place to bring the family together. This is the place where people experience the feeling of joy, sorrow, entertainment and the essence of having a family. So while building a house, kitchen is the integral part that requires utmost care. To have a most advanced and well designed modular kitchen all it takes is a thorough research, interest and proper planning. These days every person wants to have a well designed bigger modular kitchens. Modular kitchens generally consists of set of pre-manufactured cabinets that are fitted together to customize the kitchen space. Functional area of kitchen is clearly divided in order to make proper placing for all the kitchen appliances. While doing so one has to keep in mind regarding Triangle principle – cook top, sink and the refrigerator are placed in triangular. The main purpose of this triangle principle is to have an easy access and to experience user friendly positions while cooking. Another biggest decision that plays a vital role in kitchen designing is the choice of cabinet and kitchen counter top materials. These are of primary focus for any contemporary and classy kitchens. Choosing for a most sophisticated and useful cabinets at the same time are a smart choice. Many types of metallic, wooden as well as laminated cabinets are available in market. So the choice of cabinet materials plays a greatest role to showcase ones design aesthetics. Here are the few types of kitchens based on cabinets. Acrylic cabinets and counter tops forms the popular choice because of its durability and standard. Acrylic comes in many forms among which one is parapan, hi-glossy and solid pure acrylic. It is UV light stable so that its color would not gets faded over sunlight. Also it is highly reliable, repairable and water-proof. Another form of Acrylic is corian which is made up of acrylic and other natural minerals. Corian is highly resistant, durable and can be molded into different shapes. This is also available in different colors. White among them is chosen very often as it gives the rich and cool ambiance. Another attractive feature of Acrylic kitchens is its stylish outlook, perfect symmetry and clean distinguishing lines. Laminated kitchen counter tops come in wide variety and ranges to cope up with the Indian styles and climatic conditions. Laminated worktops come in different forms like wood, quartz, slate and granite. Also the lamination can be of different colors and types like – Axiom laminate, Omega laminate and Prima laminate. 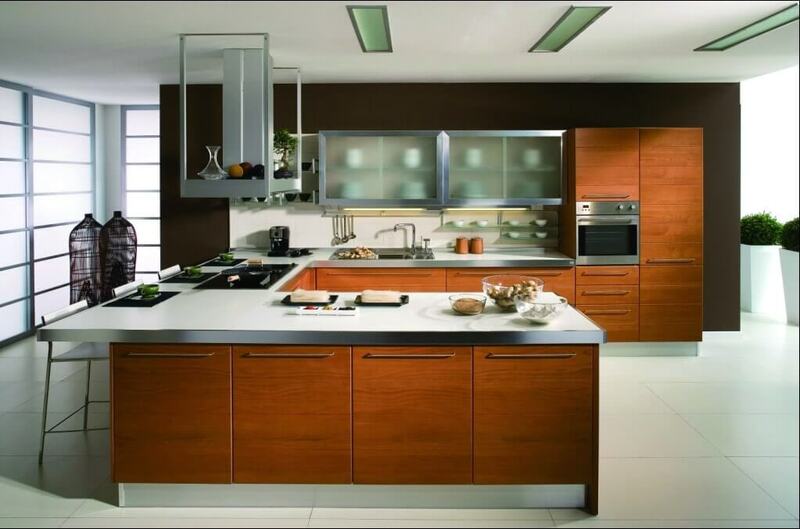 Upon deep research we have observed that laminated kitchens are best suited for Indian climates. Veneered cabinets reflect the refinement and beauty of natural wood. These are the thin slices of wood that are used as core panels and for shutters of cabinet. Veneered cabinets can also be polished to get glossy look. They come as both solid and filler material forms. These veneered cabinets are highly durable and easy to handle and clean. They serve as the best alternative for solid timber panels. Rubber wood which is also known as plantation hardwood, is straight and hard wood with small noticeable grains in it. These grains are the major attraction of rubber wood kitchens. Among rubber wood cabinets there are many forms like cherry cabinets that darken over time, Oak cabinets that contain knots in between, Maple cabinet which is popular for its beautiful outlook and Birch cabinets that accepts stains and paint well. Most importantly rubber wood kitchens are considered to be environmental friendly. If you are on the look-out of having the best kitchen which resembles the elegant granite look with minimum expenses, then flip to epoxy coated counter tops. These coatings can be done on cabinets, counter tops, work tops and floors without any side effects. The coating increases the life and guarantees the life time of coating for a period of 10 years. Epoxy coatings consist of resin materials that make it durable for many more years than those of contemporary paints. These coatings are water and heat resistant and highly economical. Soft close Mechanism: One can chose any kind of kitchen for their home teamed with soft close mechanism(also called self closing), which can be helpful is to close the cabinets and drawers of the kitchen. This involves soft closing of doors of cabinets or even the main doors which mean the doors will be closed by itself at wider angles without making noise. It is one of the most innovative, gentle and easy technology made use in modern kitchen design. So to have one such heartfelt meal, a bigger and a better kitchen is essential. Better kitchens always reflect the personalities of people living in home. As kitchen is the best place to showcase the cooking as well as designer aesthetics of a person.